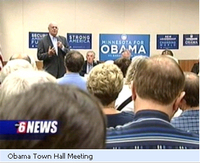 From the looks of the audience in the clip at KAAL-TV, the Obama Town Hall Meeting at the Mayo Civic Center yesterday was well attended. Not bad for a gorgeous football Sunday. In the first town hall meeting for Senator Barack Obama in Rochester national security experts took the stage stumping for the democratic hopeful. They unveiled Obama's foreign policy vision for national security. It includes withdrawing troops from Iraq within 16 months and refocusing the fight towards Al Qaeda and the Taliban.
. . ."The currently policy under president bush supported by Senator McCain has been solely focused on Iraq that had nothing to do with 9-11 and had used our resources, our troops to the point where it's very difficult to focus on the greater need," said Walz. We will hear more as Obama and McCain square off next Friday in Oxford, Mississippi, where the focus of their first presidential debate will be on national security and foreign policy. The latest Gallup survey found 48% of registered voters support Obama while 44% preferred John McCain. . . .
Our National Security is top of mind for many people and is one of the big issues in the presidential race. Today some state leaders came to Rochester to discuss Barack Obama and Joe Biden's national security plans. State representatives Tim Walz and Betty McCollum were among the participants. The focus of the discussion was the country's situation in Iraq and Afghanistan, our diplomatic relations with countries around the world, as well as solutions for energy independence. Former Major General Paul Eaton says, "Militarily, we are in a less adventages position today than we were eight years ago and as a retired soldier and father of soldiers, I have a real problem with that." Representative Tim Walz says, "We've gotten ourselves in a situation where we don't have the allegiance and allies that were once there and I think Senator Obama's been talking about building those alliances for the 21st century, reconstituting this force and using all the tools of diplomacy of soft power, economic power as well as military to bring about true national security." The panel made their last stop of the day in St. Paul.